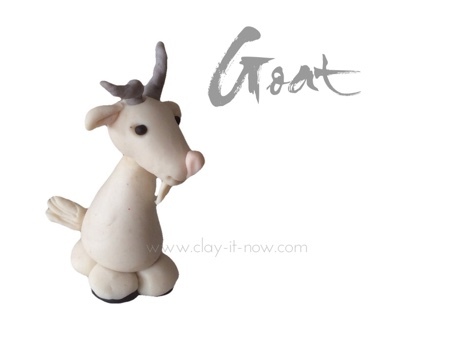 I've made this goat figurine following tutorial from 100 Fondant Animals for Cake Decorator's book by Helen Penman. Yup! the tutorial was for fondant but I used home-made cold porcelain clay. It works! As I mentioned in my best animal figurine books page, fondant and clay especially air dry clay has similar character and the modeling technique is the same. Alright! let me share my steps with you. Take your white and black air dry clay or polymer clay and a pinch of skin color clay. Roll your white clay to a big cone shape for the goat's body, slightly smaller cone for head and 4 small cones for the legs. 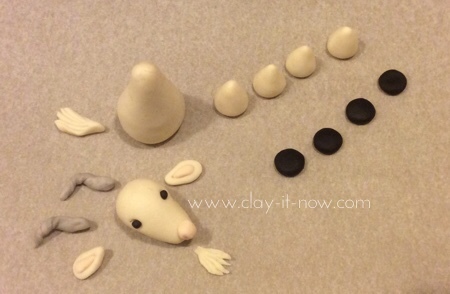 For the horn, I mixed white clay with a little bit of black color clay to make grey clay. Knead the clay and roll it to a small teardrop shape. Pull the top of the teardrop and twist it. For ears, make two small teardrop shapes, flatten it and paste a smaller flat teardrop in skin color clay on top of it. For beard, you can make small and short spaghetti shape, use clay tool or use scissor to cut flatten teardrop shape. This method used to make the tail as well. For nose, make a small ball shape first than re-shape it to a thick triangle. Use your clay tool to press the left and right side of the triangle. Also, roll 4 small ball shapes in black color clay and then flatten it. These would be the hooves. Next step would be attaching the ears, eyes, nose and horns to the head. Make small holes on top of the head, add glue and position the horns. You can adjust the horn shape until you are happy with it and then leave it to dry. Glue the ears, eyes, nose and beard to the head. Insert toothpick to hold the head and leave this to dry. While waiting for the head to dry, paste the hooves to the bottom of the goat's legs. Insert short toothpick to all 4 legs and leave it until its dry. When the legs dry, attach the body to the legs and then insert the head's toothpick to the body. 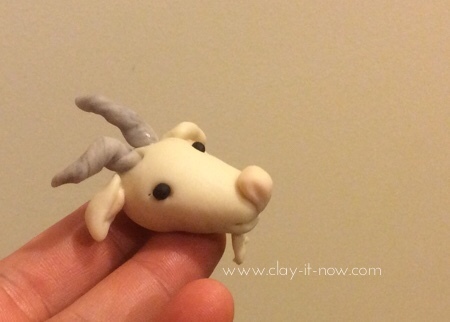 You have completed the goat figurine! 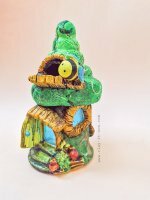 You can also upload your work to our Facebook page if you would like to share your figurine. And, please like our page for update and tutorials from others.